The Motocaddy has a very efficient digital platform that was taken from the S3 model, which was also very successful. 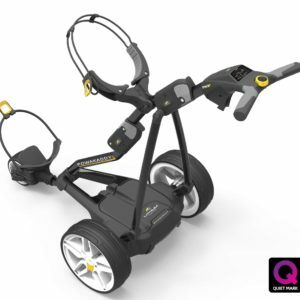 This easylock bag support allows the Motocaddy bags (not included) to easily and securely connect, however any golf trolley bag will easily fit on this trolley. Lithium Batteries are much more lightweight than lead acid making it very easy to get in and out of your car boot along with they carry a much longer shelf-life. Motocaddy offer a Battery Lithium Warranty of up to 5 years for normal use. Ever since the first Motocaddy S1 was introduced back in 2006, it has been considered as the powered golf cart that a lot of people buy in the United Kingdom. But now, the company that manufactured this product has upgraded it so that it could run using a digital platform. In this digital age, it is imperative for companies to make sure that they are moving forward as well. The Motocaddy has a very efficient digital platform that was taken from the S3 model, which was also very successful. This Motocaddy S1 is very simple to operate and understand, which is why it is not that surprising that a lot of people prefer it over other powered golf carts. The user simply has to twist any of the nine speed settings and tap the button in order to let the Motocaddy start. The S1 Digital will help the person to accelerate smoothly according to the speed selected. To stop, the person only has to tap the button again to stop. The digital platform that it runs on is of unsurpassed quality and reliability. This motor packs a lot of power but is very quiet when on. It also comes with a unique multi-platform battery tray that was designed to be able to carry “Standard”, “Extended Range” or the Motocaddy lithium battery. Made out of aluminum, the frame of the Motocaddy S1 Digital is very lightweight and sturdy. It comes with the ergonomic handle grips of the S-Series. It also has the exclusive S-Series folding system that locks by itself when folded. The wheels that come with the frame are very low-profile, too. Bags are easier to “carry” around, as the S1 Digital has supports that are fully adjustable. 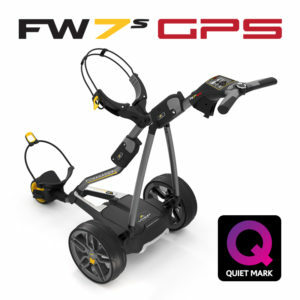 This powered golf cart is one of the best out there in the market, which is why many stores offer this to their customers. People who love playing golf (or watching others play) do not have to walk long distances with their golf stuff because they could travel at ease with the S1 Digital. Golfers could simply concentrate on their game instead of bother themselves to lugging around their things while playing. Even those who play up to 18 holes could enjoy using this cart without worrying that it would stop. The battery could reach up to 18 holes in just one charge! Everything you need is included in the box. Please charge the battery for a minimum of eight hours before using the cart for the first time.